I love fish Biryani. No recipe of mutton or chicken biryani will or can beat the taste of fish Biryani. 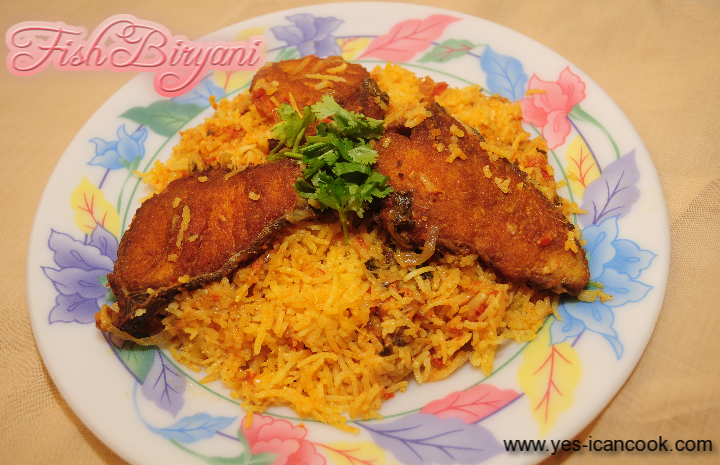 Even a person who dislikes seafood will enjoy this biryani. King fish is used to prepare biryani but any other big fish with slices and less thorns can be substituted. This is my mother's recipe and I love it. 1. Clean the fish and wash it well. I got the slices cut into quarters as it was quite big. You can leave them as is. 2. In a small mixing bowl combine 2 teaspoons of ginger garlic paste, salt, 1 1/2 teaspoons red chilli powder, 1/2 teaspoon turmeric powder, 2 teaspoons coriander powder. 3. Apply this on the fish slices on both sides and all the corners. 4. Heat oil for deep frying. Fry the fish slices till they are half cooked. Do not completely fry them. Remove them to absorbent paper and keep aside. 5. In a broad cooking vessel heat oil. You can use the oil used for frying the fish. 6. Add cloves, cinnamon and cardamom and fry for a minute. 7. Add the sliced onions and green chillies fry till the onions start to turn brown. 8. Add the ginger garlic paste and fry for a minute or two. 10. Add the tomatoes and cook for 5 minutes. 11. In the meantime Wash the rice and soak it for 30 minutes. 12. Add yogurt and continue to cook for 10 minutes. 13. Add coriander leaves and mint leaves and mix well. 14. Cook till the raw smell from tomatoes and spices disappear. 15. While the gravy is cooking, In a separate cooking vessel bring sufficient water to boil to cook rice. Add salt and 2 tablespoons of oil. When water boils vigorously add the soaked rice and cook for 8-10 minutes till rice is half cooked. Drain the rice into a colander and keep aside. 16. Add the fried fish slices one by one to the gravy and continue to cook. Do not stir with a spoon after adding fish. Hold the vessel with kitchen towel or gloves and swirl it to mix. 17. Cook till the gravy has turned thick like all biryani akhnis (gravy). 18. Remove the fish slices without breaking and keep aside. 19. Remove half the fish masala in a separate bowl. 20. Add half the rice on top of the fish masala in the vessel. 21. Add the remaining fish masala on top of the rice layer. 22. Add the remaining rice on top thus forming four layers of fish masala, rice, fish masala and rice. 23. Place the fish pieces on top of the rice, cover and place on low flame for about 5 minutes till steam forms. Switch off flame. 24. To serve remove the fish pieces. Mix the rice with the masala gently to combine.